Lumber prices are strong, and log prices are stronger, continuing to set a sustained-price record. Rising mortgage rates are still relatively low while other statistics also point to market strength. Recent trends of lumber, logs, home construction, and housing markets, are reviewed in this month’s timber report. Winter 2018 log prices have held at a record high and very steady, above $890 per thousand board feet, within a $2.00 price range for 3 months. Twenty-five years ago, in May, 1993, the log price did reach $909, but that price was a one-month spike. The March, 1993 log price was only $760, and the July, 1993 price was $817. This is an unprecedented strong log price. Several statistics point to continued strong log prices heading into the Spring: studs are continuing strong, housing starts are up 11% from a year ago, home inventories are tight, and median home values continue their steady rise. While the odds are against a repeat of the extreme weather of 2017, there are still wood products demands from the storms and fires of last year. It take time to rebuild and some insurance payouts are slow. While mortgage rates are rising, when will become a drag on the housing market? For now, in a strong economy, the increased mortgage rate is being absorbed. These mortgage rates are still very low by historic standards, except for the period of the Great Recession. The 2005 housing starts number of 1,864,000 is much lower than the prior and succeeding months that year, as well as relative to the building permit number of 2,062,000. Upon further checking, this number is correct. At times, there is occasional considerable fluctuation in monthly construction rates, that can be weather-related. 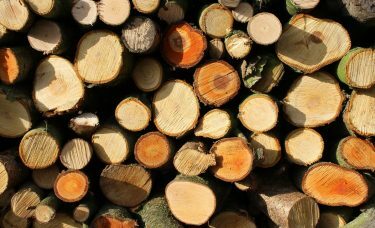 Will lumber prices drop next month? The expected tug of lumber demand, the relative shortage of logs, and pervasive workforce challenges of adding mill production capacity will be factors. Are some private sources able to respond to these log prices for another summer? How dry will the fire season be? Stay tuned.